Sławomir Połukord graduated from the Wrocław University of Technology, where he finished studies at the Faculty of Electronics (specialty: IT systems), as well as postgraduate studies at the Faculty of IT and Management (program Executive MBA, organized together with the Central Connecticut State University). Moreover, he holds a title of the Associate in Project Management obtained from the George Washington University. He is operating in the IT sector for over 25 years. To 1996 he conducted his own business activity in the scope of production and software implementations, as well as designing and performing network systems. During 1996-1999 in a branch of ComputerLand S.A. as a Director for Realizations he was responsible for performing projects of the Company in the Lower Silesia region. During 2000-2001 in NOKIA Polska he was a team leader implementing solutions of Mobile Packet Core in telecommunication networks. During 2001-2014 at Sygnity S.A. he fulfilled various roles: from Project Manager, Project Management Office Director, Division General Manager and Proxy of the Company. In the meantime he was also appointed to management boards of subsidiaries: Vice President of the Management Board of WINUEL S.A. (2010-2011), Vice President of the Management Board of ARAM sp. z o.o. (2009-2010), President of the Management Board of ZEC InfoService sp. z o.o. (2003-2009). Since 2015 at Microsoft, where he was responsible for business development in the public sector and health care sector. 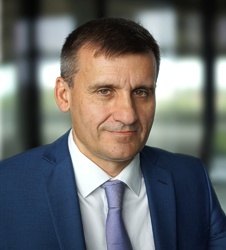 In accordance with a submitted statement, Sławomir Połukord, after undertaking the function in the Management Board will not perform any activity which is a competition to the business activity of Qumak S.A. as well as he does not perform any activities in other companies conducting a competitive activity as a partner of a private partnership or as a member of a body of a joint stock company or any other legal entity that is a competition to the Company. Moreover, he is not listed in the Register of Insolvent Debtors kept under the act of 20 August 1997 on the National Court Register. A graduate of the Wrocław University of Technology in the fields of financial management and IT science. Doctor of Information Science and International Finance Qualifications (Association of Chartered Certified Accountants – ACCA). He started his professional career as a programmer and project manager, then he developed his career in financial and consulting positions. In the years 2010 – 2012 he worked at Deloitte Advisory as a Senior Associate in the department of financial valuations and modeling as well as transaction advisory. 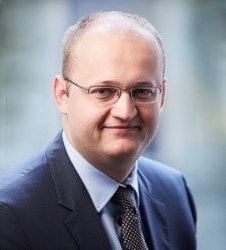 In the years 2012 – 2014, the Chief Economist and Minister’s Advisor at the Ministry of the Treasury responsible inter alia for creating a comprehensive concept and legal and financial solutions of the Polish Investments Program (Polish Development Fund), conducting consolidation in the chemical sector and establishing the Grupa Azoty and structuring PLL LOT S.A. In 2014-2016, Director of the Strategy and Analysis Department at the S.A. In the years 2016-2018, the director of PMO and M & amp; A in ProService Finteco sp. O.o. responsible for conducting acquisitions of companies for the Oaktree PE investment fund, as well as strategic and financial consulting. From 2015, he is the president of the Pointing Partners Accounting Office. Member of Supervisory Boards and Audit Committees (including Atende SA, Polish Airlines LOT, Livechat SA, Playway SA, Polish Investments Development, Ventures & Partners. Privately, he is passionate about programming and sports – from golf to paragliding. From November 2018, he deals with the area of ​​finance in the Company. Konrad Pogódź graduated from the Faculty of Electronics, Automatics and Electrical Engineering at the AGH University of Science and Technology in Kraków. He completed postgraduate studies within the scope of Business Management at the Cracow School of Business, Cracow University of Economics. For over 23 years he is working in Qumak S.A. in the IT sector. In 1995, he undertook a function of a Service Department Manager. During the years 2004-2015 he fulfilled a function of among others a Director of IT Realizations, and a Director of Organization and Development. Since 2015 he is managing realization of all IT projects at Qumak S.A. In the Management Board he will be responsible for the Realizations Division. Konrad Pogódź submitted a statement that he does not perform any activity which is a competition to the business activity of Qumak S.A. and he does not perform any activities in other entities conducting a competitive activity, as a member of bodies of a joint stock company or as a partner of a private partnership or a partnership. He is not listed in the Register of Insolvent Debtors kept under the law of 20 August 1997 on the National Court Register. Mr. Piotr Aleksander Woźniak has a higher education – he graduated from the University of Gdańsk (Faculty of Banking and Finance). In 2012, he began doctoral studies on the Faculty of Management of the Kozminski University, in the area of Management. He gained his first experience in analysis of companies and securities on the Polish capital market. During the next years his experience was enriched by knowledge and skills in the scope of management and communication, in particular in strategic management, innovations management, lean start-up, entrepreneurship, Public Relations and Investor Relations, management accounting, as well as valuation and analysis of enterprises. He began his professional career in February 1994 in Dom Maklerski Banku Gdańskiego SA. Later he worked in companies related to a capital market (among others, Wood&Co, PPTFI Pioneer or CDM Pekao S.A.) and in Bank Pekao SA in the role of a Group Companies Monitoring Team Manager, in a Division of Controlling. During the years 2007-2011 he worked in CC Group as an IR Manager, where he lead consulting within the scope of strategy of Investor Relations for public companies. From 2011 to 2012, he fulfilled a function of a Vice President of the Management Board, CFO in IndygoTech Minerals S.A. During the years 2012-2013 he was a President of the Management Board, CEO, in Baltic Ceramics S.A. (main investment of the company IndygoTech Minerals S.A.). 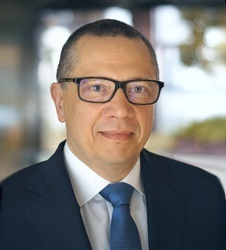 Next, until 2014, he was a President of the Management Board of Baltic Ceramics Investments S.A. (a holding listed on the New Connect market). Since September 2014, he is in the role of an Advisor of the Management Board of Strategy and Communication in Colian Holding S.A., where he takes care among others for preparing medium- and long-term development strategy for the Colian Group, analysis of the Group’s budget, co-ordination of Corporate PR and Investor Relations. Mr. Piotr Woźniak submitted a statement that he does not perform any activity, which would be competitive with regard to the operations of Qumak S.A. and that he does not perform any activities in other entities conducting competitive business activity, as a Member of bodies in a joint-stock company or as a partner in a private partnership or a partnership. Moreover, Mr. Piotr Woźniak meets the independence criteria of a member of the Supervisory Board defined by the European Commission in the Annex II to Commission Recommendation 2005/162/EC of 15 February 2015 on the role of non-executive or supervisory directors of listed companies and on the committees of the (supervisory) board. Mr. Tomasz Kruk has a university degree. He studied at the Faculty of Management at the School of Commerce and Law in Warsaw, where he obtained a master’s degree in economics (specialization: strategic management). He gained education in the field of risk management at the Warsaw School of Economics (Postgraduate Studies in Risk Management in Financial Institutions). In 2006 he became a member of The Institue of Internal Auditors, FL, USA. In 2008, he obtained the Certified Internal Auditor (CIA). He has qualifications in the field of project management (Prince2 Foundation Examination). Member of the International Compliance Association – he obtained the ICA International Diploma in Governance, Risk & Compliance diploma. He has over 10 years of experience in the area of ​​compliance audit, internal audit and special audits, consultancy audits, advisory on disputable issues, risk management and projects in the field of risk management of frauds and fraud. He carried out projects in many industries: financial, logistics, transport, real estate management, geodesy and cartography, infrastructure projects management, IT and telecommunications, hotel and gastronomy / management of holiday centers, real estate development, or in light industry. Private Equity and Venture Capital (Università Bocconi, 2018), ICA International Diploma in Governance, Risk and Compliance (2017), Diploma confirming the positive result of the exam for candidates for board members supervisory bodies in State Treasury companies (2015), Internal Audit (EY, 2013), Prince2 Foundation Examination (Infovide-Matrix, 2010), Certified Internal Auditor (IIA, 2008), Compliance / AML Workshops (Credit Suisse, 2008), Preparing Financial Statements, Managerial Accounting, Managing People (BPP Professional Education, 2006). Mr. Wojciech Napiórkowski graduated from the Faculty of Law and Administration at the University of Warsaw. He has an MBA degree (program in co-operation with the London Business School) and a CFA Level 3 (Certified Financial Analyst). He has a professional experience in fulfilling supervisory functions in public companies. He fulfilled a function in the Supervisory Boards of GTC S.A., Kopex S.A., Scanmed Multimedis S.A., and Rolmipex Nasiona S.A. (company not listed on a public market). He is an active member of the Supervisory Boards of Soho Development S.A. and Trakcja S.A. He began his professional career at a law office in 1997 (Domański Zakrzewski Palinka – Arthur Andersen Law Office). During the years 1999-2003 he worked as an Investment Manager in Emerging Ventures Limited, and then as an Investment Director in Advent International, where he took care of managing processes of purchases, restructuring and sale of companies in Poland. He fulfilled a similar role in Bridgepoint Capital during the years 2007-2011. Since 2011, he works in Abris Capital Partners (services of consulting and generating transactions on the Polish market). During the years 2012-2014 he fulfilled a function of a Vice President of the Management Board in Investors TFI. Since May 2014, he is a Managing Director in Aktivist FIZ (the first Polish activist fund). Mr. Wojciech Napiórkowski submitted a statement that he does not perform any activity, which would be competitive with regard to the operations of Qumak S.A. and that he does not perform any activities in other entities conducting competitive business activity, as a Member of bodies in a joint-stock company or as a partner in a private partnership or a partnership. Moreover, Mr. Wojciech Napiórkowski meets the independence criteria of a member of the Supervisory Board defined by the European Commission in the Annex II to Commission Recommendation 2005/162/EC of 15 February 2015 on the role of non-executive or supervisory directors of listed companies and on the committees of the (supervisory) board. Advisor and consultant in the area of capital market: Supervisory Board member of WSE listed companies: MCI Capital Towarzystwo Funduszy Inwestycyjnych SA (2009-2011), Eficom-Sinersio S.A (2015-2016), Alior Bank (2016-2017), PEKAO SA (2017). Takes part in projects related to developing strategies for selected clients, co-operates with top consulting companies in the area of acquisitions and restructuring of companies (among others PKP Energetyka, Elester PKP) and co-operation at the organization of TFI KGHM. During 1998 – 2017 took director positions and functions in management of capital companies operating on the IT market, legal services, consulting, simultaneously conducting his own business activity in the area of consulting. From 1979 to 1991 he conducted a didactic and science activity in the universities in Wrocław and Szczecin. During 1985-1999, team leader at a coordinator of a pioneer governmental IT program for the Polish geodesy, then coordinator of ICT activities in the companies of the KGHM group. From 1988 cooperated with several dozens of leading companies in the IT sector and consulting (among others EY, PWC, KPMG, BTFG). Since 2006, expert in the Sector Operational Program – Growth of Enterprises Competitiveness. Advisor at many public companies and the Ministry of Development. Member of Stowarzyszenie Ekspertów i Menedżerów Transportu Szynowego, Secretary-General of Stowarzyszenie EuroCloud Polska. Founding member of Stowarzyszenie Polska Obywatelska CyberObrona. Supervisory Board Member of Spółdzielna “Świetlik Reaktywacja” (since 2016). Founding member of Stowarzyszenie Cloud Community Europe PL (chairman of Review Committee). Mathematician. Graduated from the Faculty of Mathematics, Physics, and Chemistry, at the Wrocław University. During 1979-1991 conducted a science and didactic activities at universities. In 1986 obtained a Doctor title within the scope of technical sciences. Several dozens of trainings within the scope of marketing and managing, economy, finance, IT, NLP, BHP. Took part in many research and science works, co-operated with several universities and science centers in Poland (among others since 2016 – CEZAMAT – member of a Program Council). Broad knowledge, practical and managerial experience within the scope of many sectors: power engineering, IT and ICT, infrastructure (in particular railway transport), self-governments, industry, capital funds management and EU subsidies. Knowledge of methods of building business models, developing market analyses, segmentations, analyses of organizational structures and processes, financial engineering, restructuring of companies, building strategies. Analytical skills in the area of economic information. Practical skills in the area of modern finance for enterprises. Practical skills and many years of experience (coordination of several dozens of projects) related to construction, implementation and use of IT systems supporting enterprises management, in particular managing finance, taxed, assets and infrastructure. Activities in the area of concept, co-ordination and promotion, as well as education within the scope of cyberspace security in Poland. Program Director of a Conference “Cybersecurity of listed companies” (GPW, 2014). Experience in Big Data analyses. Experience and knowledge in the area of commercial and business law. Awarded with the Brown Cross of Merit (2005), Order of Polonia Restituta (2012), as well as numerous extinguishes and distinctions of social organizations and associations. 62 years old. Father of three adult daughters. Stanisław Ryszard Kaczoruk submitted a statement that he does not perform any activity which is a competitive activity to Qumak S.A. and he does not perform any functions on other entities conducting a competitive activity, as a Member of bodies of a capital company, partner in a private partnership or a partnership company. Newly appointed Member of the Supervisory Board meets the requirements for an independent member of a Supervisory Board set by the European Commission in Appendix 2 to the European Commission Recommendation 2005/162/EC of 15 February 2005 concerning the role of non-executive directors or members of supervisory board of listed companies and a board’s commission (supervisory). Mr. Gwidon Skonieczny is an engineer – he graduated from the Polish-Japanese Academy of Information Technology. He also studied at the Kozminski University at an MBA program for Engineers. He has many years of experience in managing projects of a high complexity level. He began his professional career as a system engineer in companies Compas, Recon and EDS Poland (PTK Centertel Account) accordingly. Then he continued as a project leader in the companies NC Virtual Systems S.A. and Nasza Telekomunikacja S.A. From 2003 to 2005, he was a project manager in PTK Centertel, and then during the years 2005-2009 and 2012-2013 in Telekomunikacja Polska/ Orange. In these organizations he was responsible for overall management of IT and telecommunication projects of substantial value. During the years 2001-2010 he was a co-owner of the company Figaro Software Sp. z o.o., which took care of production and sales of IT systems for companies in the insurance sector. During the last years, Mr. Gwidon Skonieczny lead a program of 3rd Stage of Construction of the PGE Arena Gdańsk Stadium (for the company TRIAS S.A.) – one of the stadiums of EURO 2012, he organized the Workflow projects for the Ministry of Justice (for Maxto) and a project Muzeum Pieniądza NBP (for TRIAS S.A.). Since 2013, he is employed in Italtel Poland Sp. z o.o., where he is responsible for a comprehensive management of projects. Mr. Gwidon Skonieczny has a good knowledge of IT systems engineering and programming languages. He has a wide knowledge within the scope of projects management methodology documented by the certificates: Project Management Professional, PRINCE2 Foundation and Practitioner, as well as Professional Scrum Master. Mr. Gwidon Skonieczny submitted a statement that he does not perform any activity, which would be competitive with regard to the operations of Qumak S.A. and that he does not perform any activities in other entities conducting competitive business activity, as a Member of bodies in a joint-stock company or as a partner in a private partnership or a partnership. Moreover, Mr. Gwidon Skonieczny meets the independence criteria of a member of the Supervisory Board defined by the European Commission in the Annex II to Commission Recommendation 2005/162/EC of 15 February 2015 on the role of non-executive or supervisory directors of listed companies and on the committees of the (supervisory) board. Mr. Paweł Ruka is a Chartered Accountant, a long-term Financial Director and a Member of the Management Board of Polish companies, including ZKS Ferrum SA and Ammono SA. In addition, Mr. Paweł Ruka has previously sat on the Supervisory Boards, including companies PKP Cargo SA, Bumech SA, MZCH Organika SA or PA NOVA SA. Paweł Ruka began his career in the area of ​​financial advisory services in the consulting company PwC. As part of your own business, finker | your trusted CFO, acted as a seconded part-time CFO, as well as provided consultancy and accounting services in several projects.